Surrounded by the Thar desert and circled by the Aravalli hills, Pushkar’s main thoroughfare runs along the northwestern fringes of the holy Pushkar Lake. Legend has it that it was created by the tears of Lord Shiva, which he is believed to have shed after the death of his wife, Sati. Our pick of the best places to stay in Pushkar reflect Rajasthani traditions whilst at the same time providing a comfortable stay. Formerly a quiet town, frequented only by wandering holy men and religious devotees, it has grown in size and popularity over the last few years. Today it sees a steady flow of tourists, particularly backpackers, traversing its streets. 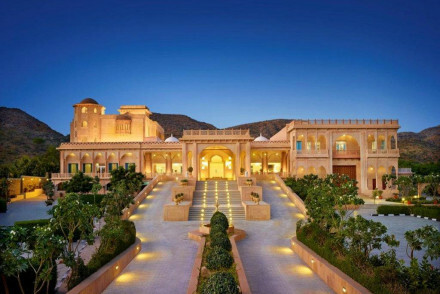 Located just a couple of hours from Jaipur, it makes for a welcome relaxing stop before or after the frenetic ‘purs’ of Rajasthan. It offers an excellent way to experience this kaleidoscopic state at a slower tempo. It is worth noting that Pushkar, being such a sacred site, is a dry town, and you will not find meat or eggs in the restaurants. However, this means that there are some excellent vegan restaurants! A must-see is the bustling market, which is awash with colour and the smell of rose water and incense. Wake up early and take a walk to Savitri temple. A fairly vertiginous climb, you're treated to far reaching views across the town and Aravalli mountain range frrom the top. Head into the Thar desert for a camel safari, a great way to explore the surrounding sand dunes. Each November the town hosts the Pushkar Camel Fair, the largest cattle market in the world. The Ajmer dargah, the tomb of the Sufi saint Moinuddin Chishti is a scenic thirty minute drive from town. Visit on a Friday to experience the intoxicating qawwalis. Our pick of the best places to stay in Pushkar are all well priced and welcoming stays, and most are located very centrally with easy access to all of the town's highlights. We've also found a luxury resort which is the only hotel to book if you can't bear to be without all your creature comforts. But don't forget that if you're planning to come for the Camel Fair in November, you'll have to book well ahead to avoid disappointment. The global chains have not yet made their way to Pushkar and so it boasts some delightful owner managed properties. Inn Seventh Heaven, surrounding a white, ivy clad, marble courtyard, blends traditional décor with pop colours. Located in the centre of town and with rooms from just £15, it's a top spot. Dia Home is situated a little out of the main thoroughfare and provides lovely homestay accommodation. Offering a variety of spacious and traditional rooms, it's thoroughly charming. Pushkar Palace is touted as the best place to stay in town and it does boast the largest and most luxurious rooms and stunning views of the holy lake below. 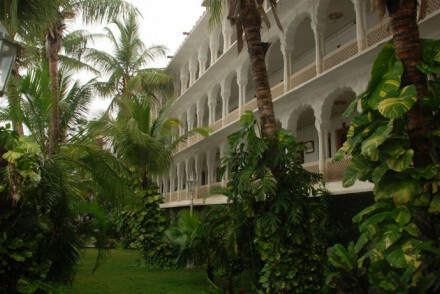 Gulaab Niwaas Palace is a wonderfully striking property just away from the busy part of town. Here you can relax by the pool and enjoy traditional cuisine. 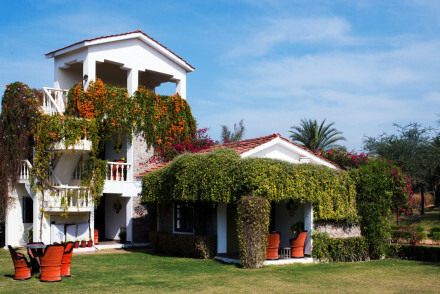 Pushkar Resort is an eco-friendly oasis set amidst the Aravalli hills. Boasting spacious cottages, green lawns, a pool and a spa, it has everything you could possibly need and serves lovely local cuisine. The Gateway Resort is dripping in luxury, and boasts accommodation in a traditional Rakhastani style with wonderful architecture. Enjoy a refreshing dip in the pool or unwind in the spa. One of Pushkar’s main incomes is its camel trade. If you’d like to experience the Thar Desert in tented luxury then a stay at Orchard could be right up your street, where they have camels on site! You're probably best off visiting in the winter, from October to March, when the average temperature hovers around 20°C. The summers are generally too hot and humid to be enjoying long days outdoors. The nearest place to fly into is Japiur Airport, located 3 hours away. You can then take a bus on to Pushkar. Browse through our entire list of the best places to stay in Pushkar. Alternatively, widen the net to search through our recommendations in Jaipur or Rajasthan as a whole. Lastly, feel free to contact one of our friendly gurus for advice. An alabaster oasis in the heart of bustling Pushkar town. 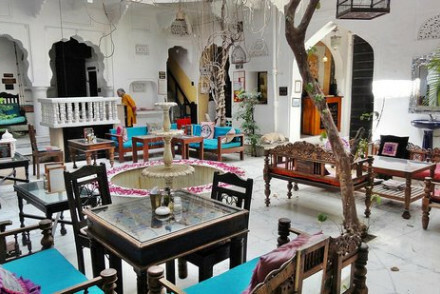 This 100 year old haveli provides boutique accommodation at a great price. Rooms are decorated in a fusion of Parisian chic and retro Indian style. Antique Rajasthani furnishings complete the look. Food at Sixth Sense is an Epicurean affair. Local markets - Pushkar market is a great place to pick up local pottery, clothes and homeware. Sights nearby - Give offerings and perambulate the holy Pushkar lake. Great walks - Up to the Savitri Temple for views across the town. 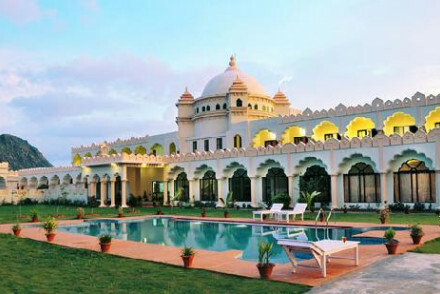 A modern Rajasthani home, opened to the public providing top class 'homestay' accommodation. Located down a quiet and unassuming street outside of town each of the five rooms is individually decorated. Breakfast is served and other meals can be taken at their sister hotel's restaurant, Sixth Sense. Sights nearby - Just a 30 minute drive the Ajmer dargah, with its nightly qawaalis, is an emmersive experience. Local markets - Pushkar market is great for picking up vintage sarees, homeware, rugs and ceramics. Great walks - A sunrise or sunset walk up to the Savitri Temple is a must. This owner managed property provides respite from the hustle and bustle of Pushkar town. Large rooms are simply decorated but pleasant and all include private terraces or balconies. There is a quiet garden with views across the lake and a pool by which to relax. Local Indian dishes are served. Local markets - Pushkar market is excellent for shopping - sarees, perfumes, artwork and antiques they have it all. Sights nearby - The holy Pushkar Lake is a serene place and great for photographing pilgrims. Great walks - Up to the Monkey Temple with far reaching views of the town. Sewara's first eco friendly offering shows its neighbours how it's done. An oasis amidst the Aravalli hills this tranquil abode features green lawns, a tropical pool and traditional spa. Chic interiors come in earthy tones and cuisine is local in both its flavours and sourcing. A great option. Total relaxation - A little oasis outside of town complete with luscious gardens, pool, spa, hot tub and sauna. 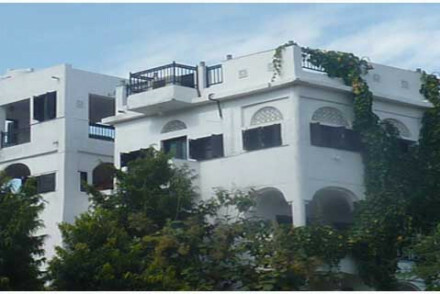 An ancestral palace located in a prime position in Pushkar town, overlooking the holy lake. Traditionally Rajasthani in style the property is filled with ornate nooks and decorative murals. Antique oak beds dominate rooms. There is a charming rooftop restaurant serving continental or Indian dishes. Local exploring - Located on Pushkar's main market road yet maintaining a tranquil feel. Sights nearby - Pushkar Lake is one of the holiest lakes in the country. You will see many Hindu pilgrims bathing in its waters. Local markets - Pushkar market is a treasure trove of fabrics, clothing, jewellery and trinkets. Great walks - Trek the several hundred steps up to the Monkey Temple for panoramic views. Conveniently located between Pushkar and Ajmer The Gateway Resort is the most luxurious accommodation option for a country mile. A more modern property it is decorated in a traditional Rajasthani style, with plenty of ornate arches and decorative marble. Boasting a pool, spa and great Indian dining. 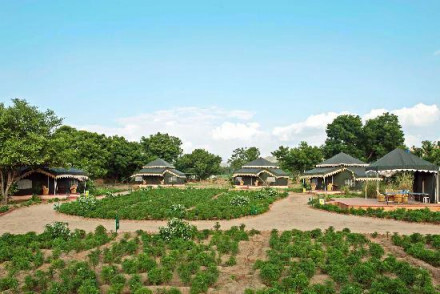 A superb luxury camp, in beautiful gardens, just a 10-minute drive from Pushkar. Tranquil and secluded, with beautifully decorated tents, excellent staff and, even better, camels in the vicinity.